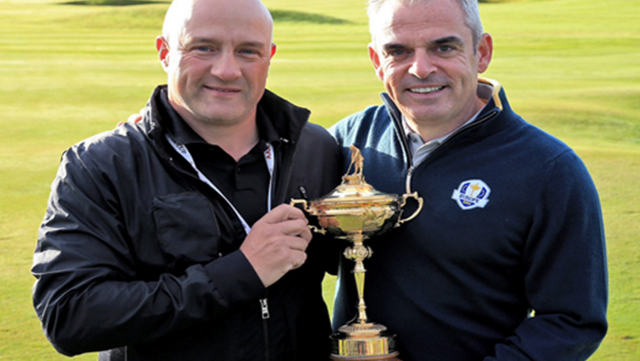 One of Paul McGinley's key 2014 Team Europe strategists Nick Bradley has penned an open letter to Danny Willett's brother Pete following his slur on US fans in a column yesterday. It is said that a person becomes the average of the five people he or she hangs out with the most. I’m not entirely sure of the age group PJ Willett teaches (brother of Ryder Cup rookie Danny Willett), but I am sure the statement above accurately reflects the conversational ‘level’ he engages in whilst sipping from his NUT coffee cup in the school playground. PJ, I know you’re excited about your brother appearing in his rookie Ryder Cup, but try to contain your fan fuelled opinions to the addlepated staff rooms in which you no doubt parade your second rate stardom. The best way to win over the opposition is to subtly and eventually win them over to your side of the fence; nowhere this has been tried has it not worked. From US army POW’s captured in Japan in 1944 to Arnie’s army eventually relenting to amicability when their king was ousted by Jack Nicklaus. No PJ, you don’t win the game by alienating and ostracizing the opponent; especially an opponent that out numbers you by five to one. You first infiltrate, you then influence and then lastly you have them identify with your cause. Try it in your next five a side little league game, it works. Forgive me again, but I do not know if you teach history? But we currently live in the 21 st century and the Ryder Cup is this year held in a country that since 2001 has a litany of public violence over and above terroristic activity. Yes, it’s far more likely, as in the case of the Monica Seles stabbing in 2003 or the Hubert Green 1978 Masters death threat (and Gary Player) that your insults that frankly any buffoon could apologize as playground tomfoolery could antagonize or unhinge any overly zealous US fan. The war on the shore was intelligently brushed over and the antics of Brookline haven’t been repeated since; we don’t need this diatribe from a 5 th column blogger. Whilst Andy Warhol was right in saying that everyone will have their fifteen minutes of fame, he clearly should have followed with… ‘like the agrestic lottery winners we see every week dangerously spending money on unscrupulous activities, not everyone should be granted free money or indeed a free voice.’ The US fans will be ebullient enough, they don’t need further goading or an excuse to achieve a slightly less than frenzied atmosphere in Hazeltine. Your last line in your rather unlettered blog was: ‘those fat, stupid, greedy, classless, bastards’..
That coming from a person whose own country is still founded on the family beliefs of Henry VIII?? Well for you PJ, opportunity has certainly knocked. One could say it’s knocked your brother who this week along with Captain Darren Clarke may have to pacify crowd members who watched the extensive coverage given to you by the Golf Channel…well done. If this week we do embody the mantra of Darren Clarke’s ‘Shoulder to Shoulder’ team messaging, it also means that your opportunism has equally made the other eleven members squirm with embarrassment. Yes PJ, they play their golf on the PGA tour with Americans, their kids go to school here with Americans and they no doubt have friends who don’t fit into 32 inch waist trousers who are Americans. You crystallize and define the modern key board warrior; a warrior who no doubt exists in a basement dwelling of his own mind dreaming up this polemic crap and thus defining his own classless act for everyone to see. Goodbye PJ – you’ve had your fifteen.